Studio Friday is all about sparkle & shine. I can relate. Beads glimmer and tempt me all through my studio. I really love working with the tiny seed beads in a artist's palette of colors. Above is my current projects. 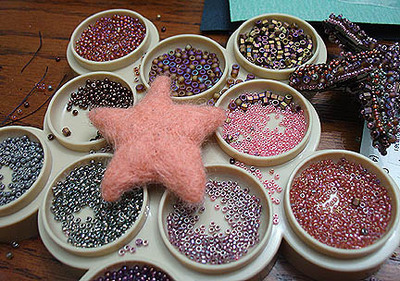 Beaded starfish on a hand-felted base. Eventually they will be the centerpieces of some Caribbean-inspired necklaces. Tomorrow I'll take a better picture of the starfish that is almost finished. You can see just a peak of it on the right-hand side there. A new edition to my studio library, Complete Craft by Katherine Sorrell is filled with all sorts of ideas to add sparkle and shine to your creative space. I really, really love this book. I picked it up in the bargain section of Barnes & Nobles. Seriously, go pick it up or order it, you'll thank me a million times over. And out of the studio, I'm looking forward to checking out the local sparkle and shine at the annual Southwest School of Arts & Crafts Fiesta Art Fair. Ohhh, I will be so inspired after tomorrow. This is the best show in the city, hands down. Can't wait. Next year I'd like to get a booth there, but competition is stiff! I hope you have a very inspiring and creative weekend. Love your beads! The starfish looks awesome, too! I would just love to have a huge bowl of these and sqwish my hands in it. Your beaded starfish is jaw dropping. I would love to see more pictures, finished and in various stages of completion. i love beads! and a beading cruise? that sounds soooo fun! would love to see more close-up pictures of your starfish project(s).